FILE - A woman stands outside her tent in a Syrian refugee camp in Houch al-Harimeh, Lebanon. Refugees in Syria’s neighboring countries often live in terrible conditions, spurring many to attempt the journey to Europe. Like the estimated 1 million other refugees smuggled across the Mediterranean last year, Mirvat Sayegh was desperate to escape the miserable conditions that all too often characterize life as a refugee in Syria’s neighboring countries. With new moves being made to close European borders to refugees, her options had dwindled. 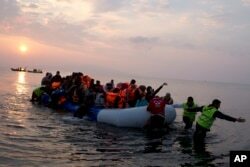 But thanks to a new project named Mediterranean Hope, the 23-year-old has found another way of making the journey. Her story and that of the project helping her are a boost to those who argue that new ways must be found to respond to a humanitarian crisis that grows worse each day. Having fled the violence of Aleppo in 2013, Sayegh and her family ended up in Lebanon, where they struggled to make ends meet. Her nephew, suffering from trauma, had stopped speaking. That was when Mediterranean Hope stepped in. Run by the Federation of Protestant Churches in Italy and the Community of Sant'Egidio — recognized by the Catholic Church as a public lay association — it offered Sayegh and her family a chance of resettlement in Italy. The offer followed months of negotiations with the Italian government that were completed in December, with Sayegh among the first of about 1,000 refugees — 500 of whom will be Syrian — to be resettled in the next two years. Travel costs for the new humanitarian corridor, which will provide routes from Lebanon, Morocco and Ethiopia, will be covered by partnering communities. “This is an experimental project. There’s none other like this in Europe,” said Sara Manisera, a spokeswoman. Traditionally, the U.N. High Commissioner for Refugees oversees resettlement, a process in which those who are deemed vulnerable can legally move to a country that has agreed to accept a certain number of refugees. Currently, fewer than 180,000 places have been made available by countries through the UNHCR’s resettlement scheme. However, that figure pales in comparison to the overall total of 4.8 million registered Syrian refugees, and the number of those who have sought a way to Europe using smugglers. “Alternatives have to be found,” said Manisera, who added that the first group of Syrians had moved to Italy within three months of the initial agreement, a turnaround considerably quicker than that achieved by UNHCR. Private sponsorship schemes for resettlement do exist in a number of countries. Just this week, UNHCR head Filippo Grandi endorsed Canada’s use of the model as one to be emulated. But Mediterranean Hope’s scope and size sets an important precedent, according to Nando Sigona, an expert in migration at the University of Birmingham. “It’s a very interesting project, and important in showing how civil society can play a role in this,” Sigona said. An EU-Turkey deal, which went into effect last week, is using the mechanism of resettlement, sending refugees arriving in Greece back to Turkey in exchange for resettling Syrian refugees from Turkey in the EU. The capping of the figure at 72,000 has led to some humanitarian agencies leaving the Aegean Islands to protest what they call an inhumane deal. But there are signs that beyond Mediterranean Hope, others are looking for new approaches to giving refugees the chance of a new life. 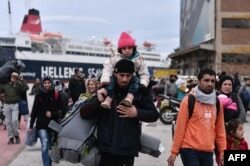 Hundreds of migrants and refugees walk at the port of Piraeus upon their arrival from Lesbos, Feb. 10, 2016. The EU's migration commissioner urged member states to accelerate relocation of refugees from overstretched Greece and Italy. Amnesty International has called for 480,000 refugees to be resettled, reflecting, it says, estimates that 10 percent of refugees fall into the "vulnerable" category. And at the end of this month, the U.N. body is holding a ministerial-level meeting that will be looking into the issue. Amnesty’s Khairunissa Dhala is cautiously optimistic but said all possible options need to be explored to encourage “those who wouldn’t usually be receptive to taking refugees,” with the increased use of scholarships as another alternative. Manisera, meanwhile, hopes that despite the political climate, the meeting will encourage more schemes like Mediterranean Hope. At the very least, Sayegh, who made the move to Italy with 92 other Syrians last month, can now look forward to Italian lessons and a fresh start. “I want to learn as fast as possible, so I can be independent, so I can work, and so I can begin my studies again,” she told VOA.